In this week's Plus report, I'm going to do something special. I'm going to imagine that I have somehow become a wealthy philanthropist (which I'm obviously not), and that I decided to launch an entirely new newspaper with the aim of covering the election. And so the question is, as a media analyst, what would I do differently? How would I put a newspaper like this together? How would I organize the newsroom? What would my focus be? And how would I instruct my journalists to work? Well, that is what this Plus report is about. I have also decided to make this an episode of my podcast, so like the last time, you can choose whether you want to read or listen to it. The purpose of this article is to make you think. I have no plans to start a newspaper, but if someone ever were to make a newspaper like this, it would be one that I would subscribe to. I came across the graph below from Bloomberg the other day. 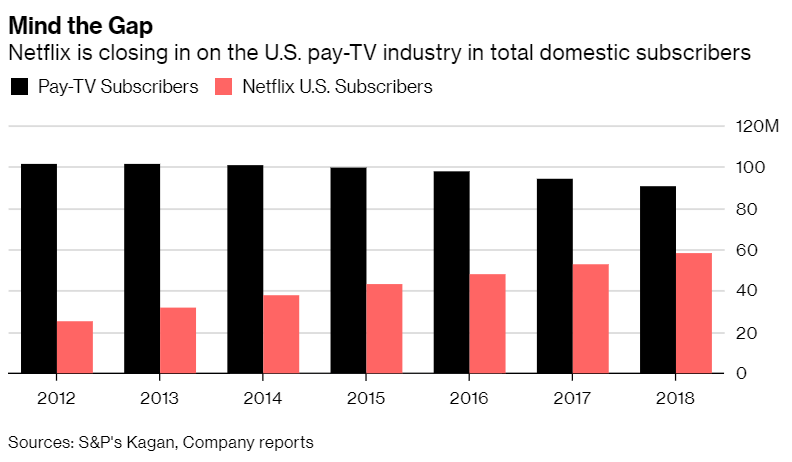 It illustrates how Netflix is on the path to surpass the entire US pay-TV industry in terms of the number of subscribers. I love graphs like this. Not because I take joy in the industry losing their market, but because it's a fascinating look at how things change. What you essentially see here is protectionism at work. The old TV market has been very slow to change, partly because they were so big and so many people were using them. But now, as you can see, their stable audience numbers are suddenly beginning to decline, and this will likely accelerate in exactly the same way we have seen with so many other industries. It's a sharp reminder that it doesn't matter how big you are, you always have to create the next thing. Don't get me wrong, we all understand why old and powerful companies don't change. Everything acts against them. They have massively expensive and expansive infrastructure, organizational units, contracts, and the financial structure of their old business models, that all force them to stick with what they have always done. But we see this trend repeat itself over and over again, and the same thing will eventually happen to Netflix as well. At the start of this year, I predicted that 2019 would be the year everyone would talk about newspaper bundles or the Spotify for News model. And so far, this prediction has turned out to be true. As you may know, I have long argued against this model, because I have yet to ever see it actually working. There are variations that might be interesting, as I talked about in "The Challenge with Having Multiple Publishing Markets for the Same Publication", but overall I remain skeptical. Instead, my advice is for publishers to focus more on doing something that makes them unique, and to find ways to be picked. However, one of the frustrating things about the bundle model is that in theory it always sounds like it should be able to work. Imagine that you as a publisher have one million visitors per month for a publication priced at $8/month. And then imagine that you are only able to convert 2% of your audience into loyal subscribers. This means your annual revenue would be ((2% of 1,000,000) * $8) * 12, which means you will have 20,000 subscribers, generating a revenue of $1.92 million. Well, that's not a lot of money. So what if we instead joined forces with 10 other magazines to create a bundle? Well, let's try that. So, now we have 10 magazines, each bringing one million visitors (aka 10 million in total). And, because we are now offering a bundle, we are going to raise the subscription price to $12 instead of $8 per month. This sounds like a pretty good deal. People only have to pay 50% more, but they are getting 10 times the amount of content. And because of this 'better deal' we now also assume that we would be able to convert people at a 50% higher rate than before as well, meaning instead of 2% converting to subscribers, we will now have 3%. All of this sounds perfectly reasonable. So, let's do the math. ((3% of 10,000,000) * $12) * 12 gives us 300,000 total subscribers and a total revenue of $43.2 million. We then have to split this revenue between the 10 magazines, which means that each will now earn $4.32 million. This is amazing. Before, we only earned $1.92 million, but now, with the bundle model, we can earn $4.32 million. But it gets better. One of the reasons most publishers didn't focus on bundling in the old days of print was that we had to worry about production and shipping costs. If you were a single magazine earning $1.92 million, you only had to produce 20,000 printed copies of the magazine ($96 in revenue per magazine copy), but now with the bundle, all the ten magazines would have to ship a copy to all of the 300,000 total subscribers, giving you a total revenue of only $14 per magazine copy. So, doing this in print would very quickly fail because the cost would exceed the revenue per copy. But in the digital world, we don't have the same production cost. It doesn't really matter in terms of website hosting whether you have 20,000 people see an article, or if it is 300,000 people. I mean, that is likely only going to cost you something like $200 per month. It's nothing. So, the bundle, in theory, sounds amazing. You have a much higher traffic potential, you can potentially set a higher price because you are offering so much more, your conversion rate might be higher, and, since it's digital, your cost isn't really affected by it. Well, the problem (as I mentioned to begin with) is that something goes wrong when we try to turn this theory into reality. And, from what I hear from many different sources, and especially when you ask the publishers themselves, the bundles didn't really work so well for them. The reason is not just one thing. It's a combination of many different factors. One factor is that it makes the publishers feel like random products in a supermarket, meaning it's much harder to stand out. Another factor is that all of these bundles force publishers all to do the same thing, so every article on Apple News is basically the same format. And this is not a good limitation to have in the future. There are other factors as well, but most of all, something odd is happening when it comes to the revenue. In theory, these bundles are supposed to make a ton of money, which would mean that each publisher would earn more as well. But in practice it is always the other way around. The bundles end up paying publishers less per reader than what they could earn individually ... so it ends up cannibalizing them instead of helping them create a new market. I would love to be proven wrong some day, and if someone knows of a bundle that works, please do get in touch. I would love to hear about it. But, for now, and from what I hear directly from publishers, the theory doesn't match reality.